RECIPE TITLE "Ham Georgia With Peach Garnish"
... more great recipes from Jacques Pepin on our GREAT CHEFS page! A whole ham is an impressive main dish for a large party and is ideal for a buffet. 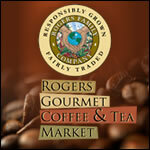 The fully cooked hams available at your butcher shop or supermarket improve greatly when cooked in water. After recooking, the ham should be allowed to cool in the cooking liquid before it is served plain, warm or cold, or then baked, as it is here, with a peach-mustard glaze. The peach sauce served with the ham is optional, but made with large ripe yellow Georgia peaches, it is a delicious complement to the meat. For a smaller party, half a ham can be used and the cooking time cut almost in half. Put the ham in a large stockpot, and fill the pot with enough cold water to cover the ham. Bring the water to 170° F to 180° F (below the boil; if boiled, the ham will crack open at the joint). Cook at that temperature for 3 hours, then let cool in the cooking water. When ready to proceed with the recipe, remove the ham from the water. With a knife, remove the skin from the ham, and trim the surface of the meat where it is brown and skin-like around the shank bone. To make carving easier later on, remove the pelvis or hipbone by running a knife around it. When the skin has been removed, trim off all but a thin layer of white fat from the surface of the ham. Run the point of your knife in a criscrosss pattern through the remaining fat on the top of the ham, cutting slightly into the surface of the meat. This scoring will help the glaze adhere to the meat while it cooks. Preheat the oven to 350° F.
For the peach-mustard glaze: In a small bowl, mix together the preserves, pepper, mustard, balsamic vinegar, and allspice. Spread this coating on the top surface of the ham, place it in a roasting pan, and bake in the 350° F oven for 30 minutes. Reduce the heat to 325° F, and continue cooking the ham for 1 hour. Sprinkle the powdered sugar on top, and cook for another 30 minutes, until nicely glazed. Transfer the ham to a platter, and set it aside in a warm place while you make the peach sauce. Discard the accumulated fat in the roasting pan, and add the 1 cup of water to the drippings in the pan, stirring to loosen and mix in the solidified juices. Add the demi-glace and bring to a boil. Reserve for use in the peach sauce. For the peach sauce: Heat the butter in two large skillets, 2 tablespoons of butter per skillet. When it is hot, add half the peach wedges to each skillet, and sauté for 2 to 3 minutes. Sprinkle with the sugar, dividing it between the skillets, and continue cooking for 3 to 4 minutes longer. Add the dried peach julienne and the vinegar, half to each skillet, and stir to mix. Combine the contents of both skillets in one saucepan. Strain the reserved demi-glace mixture over the peaches, and stir in the salt. if the sauce is thinner than you would like, add the dissolved potato starch, and bring to a boil. Boil 1 or 2 minutes. At serving time, stir in the basil. To serve: To make carving easier, make a vertical cut down into the ham approximately 1 inch above the shank bone. The object is to make a guard that your knife will not go beyond when you slice the ham; this will give a clean bottom edge to the slices and also protect your hand from the knife in case it happens to slide while you are slicing the meat. Slice the ham on the bias, stopping at the cut edge, and arrange the meat on a warm platter. Serve three or four slices of ham per person with a few slices of the peaches and the sauce spooned around and over the meat. 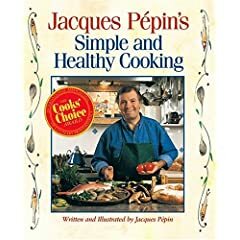 Like Julia Child, Jacques Pépin offers readers delectable French-based recipes while teaching vital, confidence-building techniques. 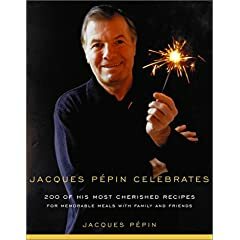 Jacques Pépin Celebrates is another winning signature venture that offers 200 recipes with terrific color-photo-illustrated techniques. Containing largely updated recipes from Pépin's out-of-print Art of Cooking, and the companion to his eponymous public television series, the book provides formulas for a wide range of celebratory as well as everyday dining occasions. This is not a resource for last-minute cooking, but one that rewards cooks not only with great food, but with the tools they need to expand their repertoires gloriously. From "a great teacher and truly a master technician" (Julia Child), a new cookbook full of faster-than-ever food, including dozens of elegant "minute" recipes. Jacques Pépin Fast Food My Way was an immediate sensation, captivating cooks and critics, who called it "fabulous," "chic," and "elegant." Now America's first and most enduring celebrity chef does himself one better, with recipes that are faster, fresher, and easier than ever. Only Jacques could have come up with dishes so innovative and uncomplicated. 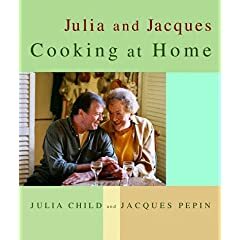 Julia and Jacques Cooking at Home is the companion volume to Julia Child and Jacques Pepin's PBS series of the same name. The setup works like this: the two opinionated TV cooks confront different ingredients on each show, then make their way through to the finished dishes that make up a meal. The recipes reveal themselves along the way. What's most important here--and it shows up in the cookbook--is that there is no one way to cook. The point of the book isn't to follow recipes, but to cook from the suggestions. And Julia and Jacques have many, many suggestions wh en it comes to home cooking in the French style. And many tips, for that matter. Take chicken, for example. "Not everything I do with my roast chicken is necessarily scientific," Julia says. "For instance, I always give my bird a generous butter massage before I put it in the oven. Why? Because I think the chicken likes it--and, more important, I like to give it." Julia sets her chicken on a V-rack in a roasting pan in a 425-degree oven that she then turns down to 350 after 15 minutes. Jacques roasts his bird at 425, on its side, right in the pan. "To me," he says, "it's very important to place the chicken on its side for all but 10 minutes of roasting." After 25 minutes he turns his chicken over, careful not to tear the skin, and lowers the heat to 400. The bird finishes breast-side up for the last 15 to 20 minutes. # Jacques Pépin, America's favorite French chef, makes your cooking easier with 150 timesaving recipes.Make crackers by spritzing wonton wrappers with oil and bake until golden. # Use frozen butternut squash for quick soup. # Freeze salmon and cream cheese appetizer rollups for easy slicing. # Prepare cheese straws appetizers with frozen puff pastry. 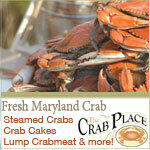 # Need an elegant entrÉe in record time? SautÉ pork cutlets with prunes and steak sauce. # Mix melted chocolate with whipped cream for quick chocolate mousse. "Healthy cooking should taste good, and Jacques has done it in this very attractive new book full of good ideas." -- Pierre Franey, author of Cooking In France and host of the TV cooking series of the same name. 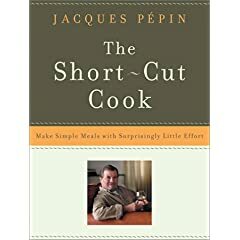 "It is with my greatest pleasure, both personally and professionally, that I recommend this delightful book of Jacque's Pepin's to anybody who wants to cook, live and eat well. He is the ideal guide." -- Barbara Kafka, author of Party Food, columnist for Gourmet magazine and TV personality. "This book is a definite must for those who enjoy cooking and eating simple and delicious food." -- Martin Yan, author of Yan Can Cook and host of the TV cooking series of the same name.